Our equity selection process simply seeks out companies whose fundamentals support our desire for high-quality, sustainable, and consistent earnings growth. This process includes both qualitative and quantitative analysis. Insights are more meaningful when they are supported by numerous factors. The greater the number of confirming variables the higher the level of confidence we can have as an investor. Numerous qualitative elements are considered in our selection process including the experience and track record of senior management, economic and industry dynamics, and sustainable competitive advantages. We also incorporate a wide variety of quantitative variables. Below we share some of the key factors and ratios. Although these are important, they only represent a sample of our analytical efforts. A strong balance sheet allows a company to handle adverse marketplace conditions better. During difficult conditions, weak balance sheets become exposed and limit management’s flexibility. Balance Sheet strength can be measured multiple ways. One of our preferred methods is to compare the total debt held by a company to its ability to service the debt. 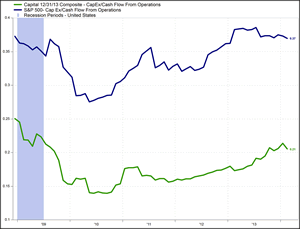 In the chart to the right (click it for a larger view), we compare the Total Debt/EBITDA (raw cash flow) ratio of our portfolio to the companies in the S&P 500. 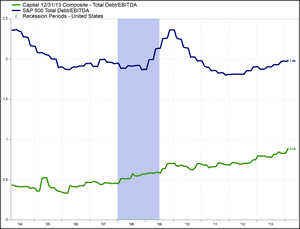 Combined, our portfolio companies hold Total Debt equal to 89% of the EBITDA generated. 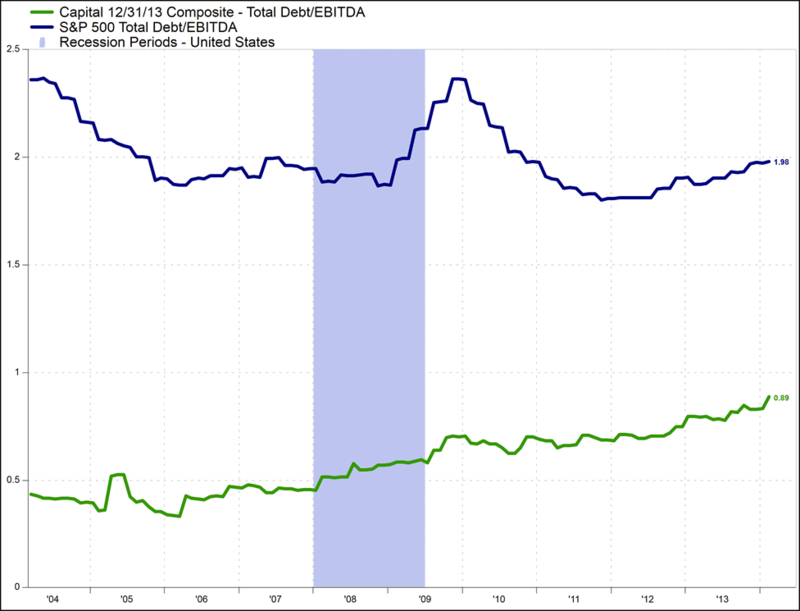 This compares well to the S&P 500 companies that hold 198% of Total Debt to EBITDA. In difficult times the more cash flow available to service debt obligations the more flexible and nimble a company can be. The strong relationship between profit growth and price appreciation over time implies that if a company can sustain profit growth for an extended period, its shareholders will be rewarded with attractive appreciation. A consistent balance of revenue growth and operating earnings growth over time is one of our preferred indicators of sustainability. Too much dependence on margin improvement (the difference between earnings growth and revenue growth) could lead to problems when economic conditions are unfavorable. 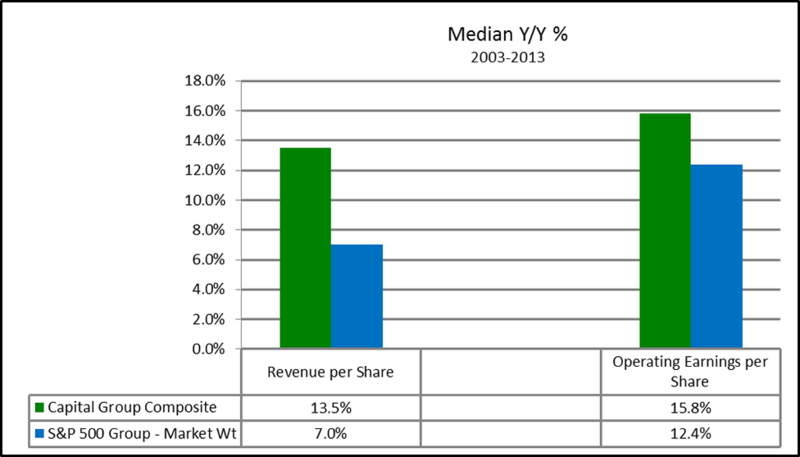 In the chart to the right (click it for a larger view), we compare our portfolio companies to the S&P 500 companies over the last 10 years. A significant factor in a company’s ability to consistently produce profit growth is the capital intensity of the business. More capital intensive businesses use higher levels of capital expenditures to support growth and, therefore, tend to experience more earnings volatility over time. 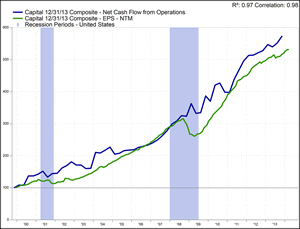 Likewise, less capital intensive businesses require fewer expenditures to support growth and allow management more cash flow flexibility to enhance shareholder value during all economic conditions. 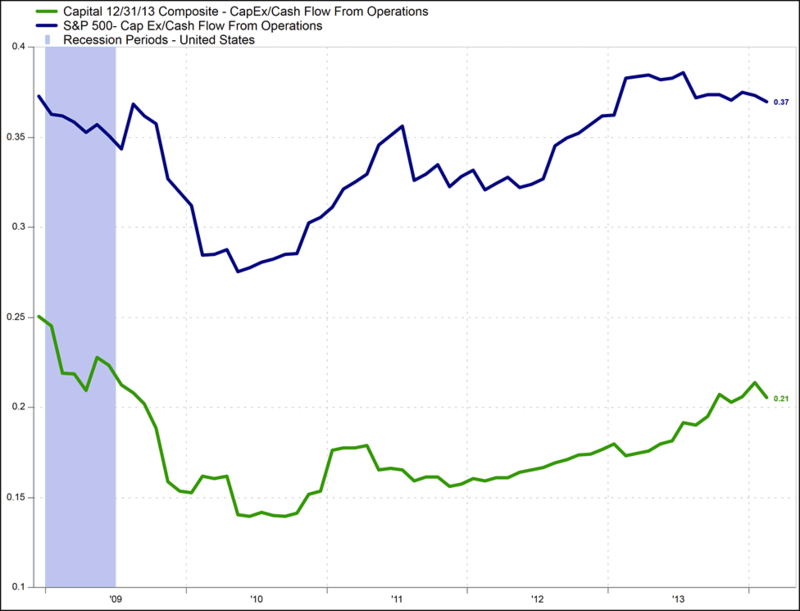 The chart to the right (click it for a larger view) compares the Capital Expenditures to Cash Flow From Operations for our portfolio companies and the S&P 500 companies. Presently, our portfolio companies spend slightly over 20% of Cash Flow From Operations on Capital Expenditures compared to 37% for the S&P 500 companies. Our goal is to maximize the probability of achieving superior results. We believe our disciplined adherence to our fundamentally based investment process gives us the best opportunity to reach our goal.